API stands for application programming interface. 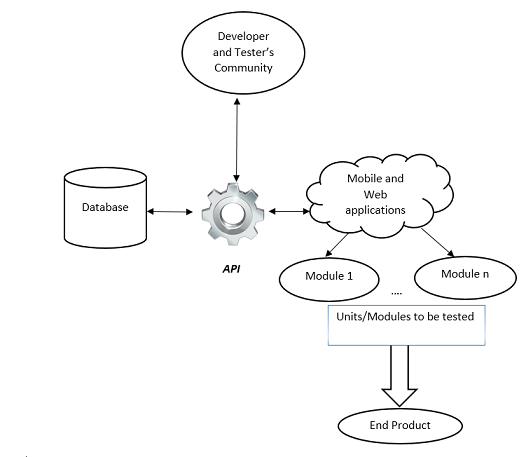 We can understand API as an intermediate which enables interaction between two software systems. An API is a set of functions, procedures, routines and protocols. It can be in the form of direct software links that trigger some action on the event of a call to deliver certain functionality.More elaborately, an API can be defined as a set of commands that aims to test a system's functionality as a whole. API Testing primarily aims to test the business logic layer of the system's architecture.API testing is primarily handled by the QA team, which requires them to run any API on top of a particular build meant to serve a specific purpose. Thus the crux of the story is that an API can be termed as a set of subroutine calls, a library, protocols or a particular functional that helps to trigger other actions. An API can be used for an operating system, database system, hardware functions or some web application. It is aimed at testing each single module as and when it is ready. Either use manual or automation testing to conduct unit testing. 1. API testing is basically black box testing which is simply concerned with the final output of the system under test. 1. Unit testing aims to verify whether the module delivers the required functionality. The development team monitors unit testing activity and makes necessary changes wherever required. 2. API tests are executed only after the build is ready. (an API test can just be a part of unit testing because it is itself a unit of a complete software application.) 2. Unit test code or test script is written by the developers (automation testing). 3. API testing must portray the system as a whole as it is the user interface that an end user will interact with. 3. A major emphasis is on the fact whether each unit or module works perfectly fine in isolation. That is, dependency should be least to ensure a robust module design. An API can be thought of as a library that is often included into a code to reflect a certain type of behaviour. For example, we can use a Java API in Scala as they share compatible bytecodes. When one is involved in API testing, the motive is to figure out whether we are getting a logically correct result. A unit test on the contrary is a way to ensure that a specific functionality is contributing to the overall system functionality.